Arrows or A, W, and D to move. SPACEBAR to retrieve anomalies. 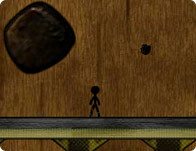 Click and hold mouse to aim, drag in direction of desired gravity, then release to fire. R restarts the current level.